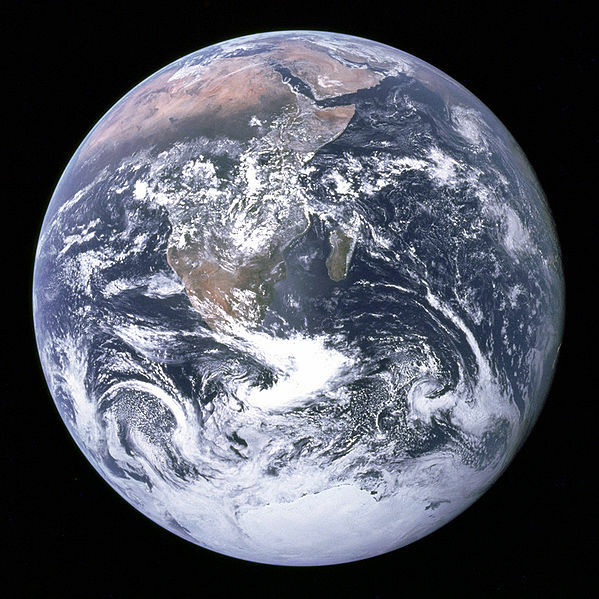 The Blue Marble is a famous photograph of the earth taken on December 7, 1972, by the crew of the Apollo 17 spacecraft at a distance of about 45,000 kilometres (28,000 mi). Africa and part of Saudi Arabia are clearly visible. The picture is part of a series published by the U.S. National Aeronautics and Space Administration (NASA) showing stunning views from outer space. The name “Blue Marble” is thought to have been coined by the Apollo 17 astronauts to describe the image of Earth they viewed from their space capsule. Apollo 17 (photographer unknown). Full Earth showing Africa and Antarctica – 1972. NASA Johnson Space Center, NASA photo ID AS17-148-22727. Accessed 25 June 2010. The Blue Marble from Apollo 17: Image of the Day. earthobservatory.nasa.gov. Accessed 25 June 2010.